Discipline is an important aspect in all kinds of organizations. It helps to maintain organizational harmony and unity and helps the organization to work properly without any issues that may arise out of indiscipline and insubordination. Maintaining discipline is necessary for the well-being and future growth of the enterprise. A lot of rules and regulations are thus made by the firm for the employees to adhere by, and any breach of the rules is liable for disciplinary action Form Samples. 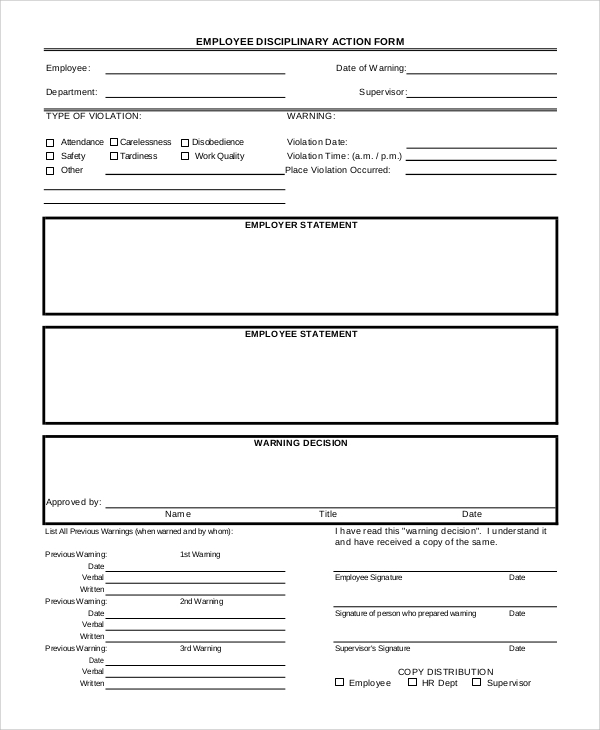 The following is a list of sample disciplinary action forms. 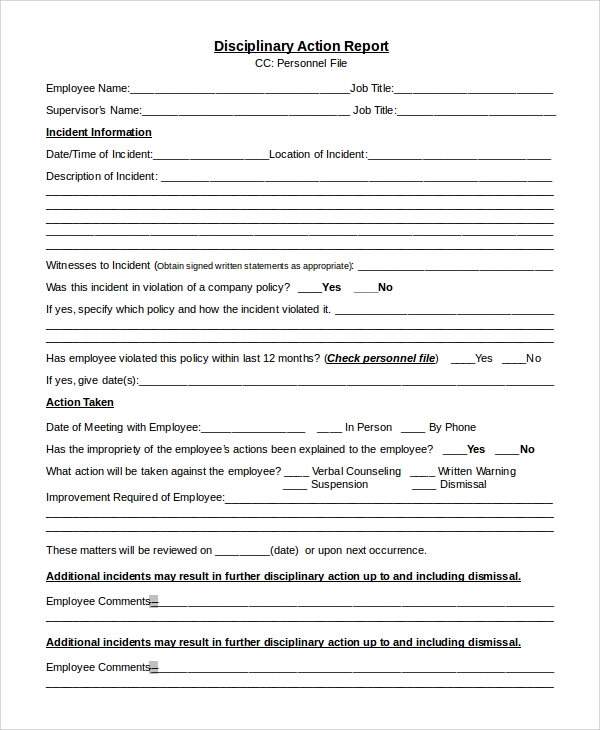 When an employee breaches the rules and regulations of the enterprise where he/she might be endangering the quality of work or their personal safety and the safety of others, an employee disciplinary action form can be issued. A disciplinary action form usually consists of the information that pertains to the name, department and the nature of the breach of rules of the employee and the warning or list of warnings issued. You can also see the Sample Order Forms. A notice of disciplinary action form is a type of form that acts a notice to the employee, summoning them to a disciplinary hearing and also receiving the acknowledgment of its receipt by the defaulting employee. The sample disciplinary action forms are useful for organizations or institutions that deal with a large number of employees or students and thus, the preservation of discipline and authority is of paramount importance. 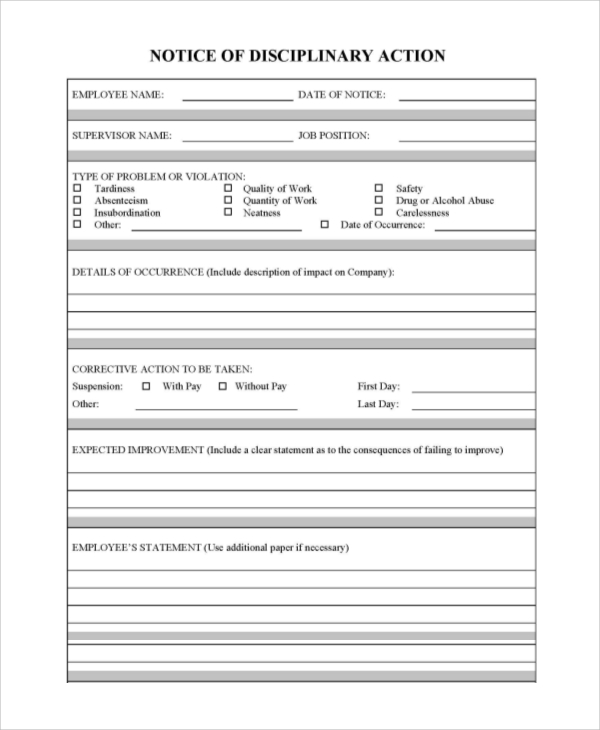 Such sample disciplinary forms act as a vital instrumental in preserving records for an employee’s or student’s conduct. You can also see the Sample Schedule A Forms. 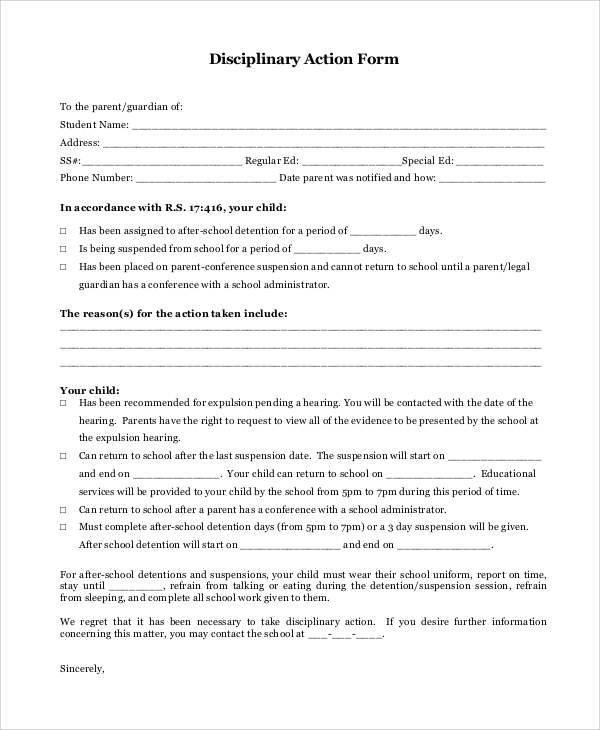 A student disciplinary action form is a form where students are warned about their misbehavior, and the students accept the receipt of the form. On the breaking of a rule or regulation, the student may be punished by the procedure established by the institution. 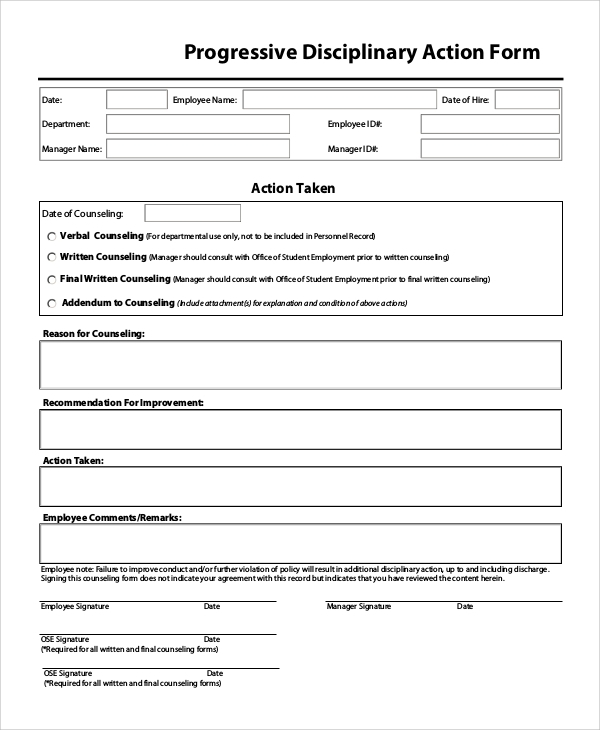 The above sample disciplinary action forms are aimed towards those organizations or institutions where the maintenance of discipline and order are of the highest importance. Maintaining discipline and keeping a check on defaulting employees and students are always kept on record by using these forms, and it helps in identifying the repeat violators and expel them for the institution. You can also see the Sample Release Forms. We have a large number of Sample Incident Report Forms with us. Choose the one that appeals to you the most and which suits your needs. The templates being completely editable can be used as disciplinary action forms in their right. 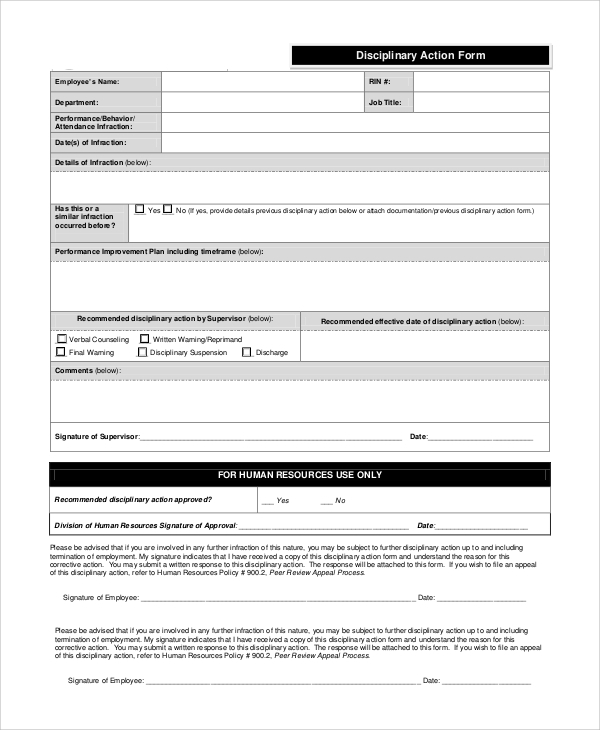 Or, they might be utilized as a reference for creating your disciplinary action form.